Today we celebrate, once again, the glorious idea brought to us by our dear friend MIMI of "Mimi Writes". 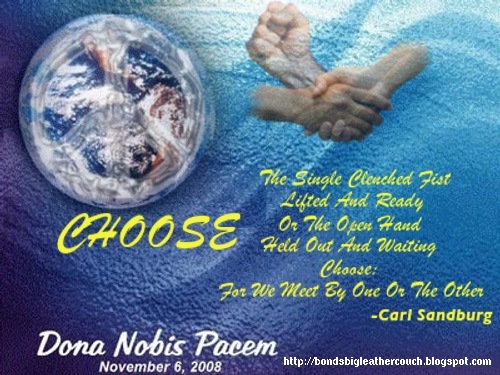 BLOGBLAST FOR PEACE! Begun 4 years ago, this idea has exploded throughout the internet and is now on Facebook and Twitter and a host of other sites. How did it all begin? It is a much better idea to let Mimi tell you the story herself, so please go read about Papa's Marbles and find the origins to this call for Peace. Some have scoffed at this idea - wikipedia - but when you have Peace Globes being sent from the entire US and some 50 countries, well it must touch people's hearts indeed. 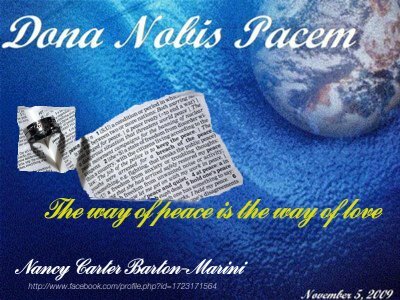 I have been honored to participate in all 7 BlogBlasts For Peace and will continue to be a Peace Globe Worker Bee as long as I am taking a breath, or until the world finds a more peaceful solution to our problems. Each year I have selected something musical to illustrate the call for peace and this year is no different. What is slightly different this year is I have found a song that many probably have never heard. Written by one of my new friends here in Memphis, Ms. Reba Russell, it is a call for peace and love...a call for the end to hunger and greed and abuse as well as the end to war and pain. Will we find the answer to all of these problems in my life-time...well, I can only hope it is so. It takes one person to do a kindness to start a revolution of kindness...the concept of 'paying it forward'...helping that older woman across the street...holding a door for a woman or a man, so it does not close in their face...seeing someone on the side of the road and stopping to offer assistance...or just a smile at a stranger on the street as you pass by on your way to your destination. On this day, I forget about the differences I have with others...I look to the positive of our world. This past Tuesday we went to the polls here in the US to select the individuals we think are best suited to represent us in government. The last years have been rife with bitterness and hate and undeclared war between our political parties. We would like to tell the world that we are above racial and ethnic divides, but in all reality, we are still fighting those battles. The instigators who are continuing to try and divide our great country need to take a step back and S-T-O-P now, before we find ourselves in the middle of another civil war. What? Think it can not happen? Do not be blind to those who spread lies and hate...and I am talking about those on both sides of the issues. If we can not make this better, what will our children and grandchildren and great-grandchildren be left with, but a history of deceit and hatred and bigotry. Just reach out to someone who is not like you and extend your hand in friendship. No one says we must all think and act alike - me especially, but accept that we are all equal and all have the right to express our feelings without the hatred which has permeated our society today. If we can't get it right here...how can the earth get it right. And if we can't get it right for the earth, there might not be one someday very soon. BlogBlast For Peace, Dona Nobis Pacem, Mimi, Papa's Marbles, Peace Globes, Reba Russell. Outstanding post sir. May peace be yours this day and always. Beautiful post. Thank you for joining in. Your link on Mimi's site goes to the wrong piece. You might want to change it. JAMIE: Thank you...I did not put the link there, but will go correct it. Peace you you today and always. When peace in my heart is eluding me, music is what always brings me there. I know the same is for you, my friend. Beautifully written. Love IS the cure for everything. Thanks for introducing us to Reba and the music you so graciously share with us each week on your show. My post was about music and love as well...in an imperfect world...You've combined hopeful words and music with dire reality. Peace and much love to you and Nancy. Nicely said. Great song. One of my favorite things about the Blog Blast is that it's a feast of good music. Every post I read, I find myself thinking "I wish I'd said that." A great posting. Peace to you and your family,my efriend. oh hell yeah! Best song ever for this event! New to blogging second event I have participated in [1st one was Practical Magic Blog Event]. Peace man...not just sporting an emblem...passing it around blogstyle, baby! Mimi has inspired something wonderful indeed. Oh what memories you have shared. Peace Globes over the years...wonderful. And you're right...till our last breath. It's just the way it's going to be. Have a peaceful day dear friend! 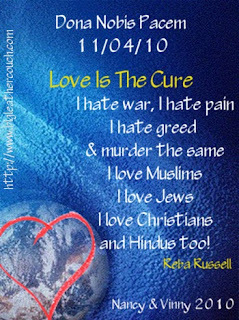 Love is the cure for everything... wonderful post! I can't say anything better than what everyone else is saying. Very good. Peace. I'm running late and trying to get mine up now. 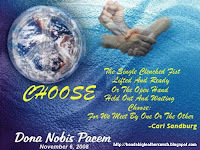 Blog hopping on this peace out-night to share peace greetings with fellow peaceniks like yourself! Great post. I especially like Reba's words of peace. Thanks for sharing! Great! and I loved seeing all your previous globes. What pawsome globes - past and present! What great music that is? Love is indeed the cure for everything. Loved all of your globes and your thoughts are fantastic. I bow to Mimi's awesomeness. She is the best! I truly believe in "paying it forward." We all need to do that. The world can be quite harsh. A wonderful thing to aspire to. And luckily, it's something each person can do. That's how to start the revolution of peace, by spreading some in our daily lives. A most excellent post, Bond...I have read so many over the last few days, and yours kinda sums it all up! Getting here a bit late but the sentiments are the same - great post and I think the Beatles had it right when they sang "All you need is love". Peace to you and yours today and always! 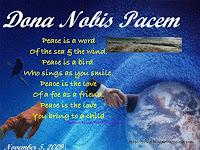 Thanks for posting for peace since the beginning. I love your "sitting on the couch for peace" globe.........I do a lot of sitting for peace too:) Well written and inspiring post. Many thanks! Peace to you and yours. Wow... all seven? 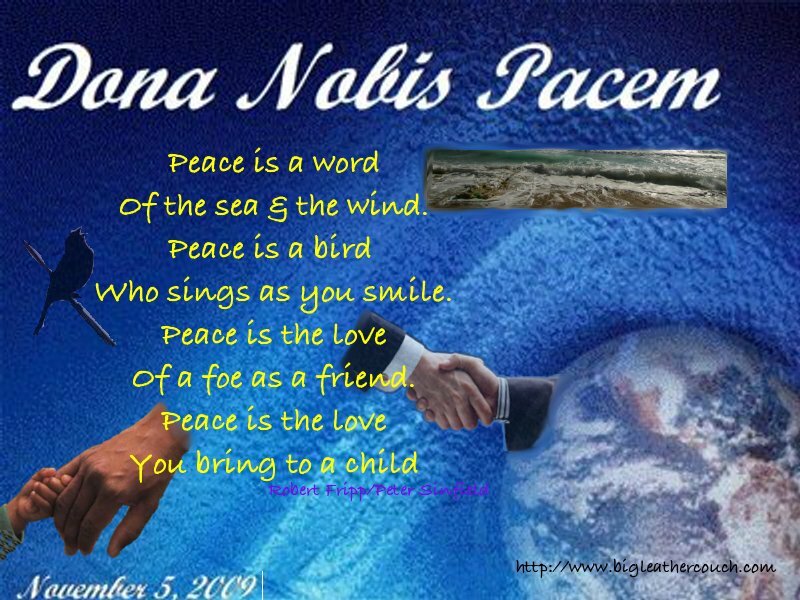 You're a Peace Globe veteran! I love the way you laid them all out like that. Sort of layers of peace.